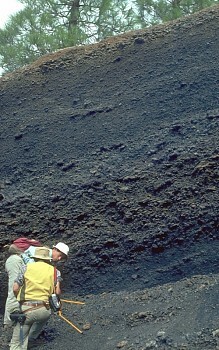 Scoria exposed in the cross section of a cinder or scoria cone. Credit: J. Lowenstern / U.S. Geological Survey. A highly expanded form of scoria is called reticulite, where bubble walls have burst, leaving a three dimensional network of delicate glass threads. Because reticulite is so expanded, some people call it basaltic pumice.